The moment is finally here! 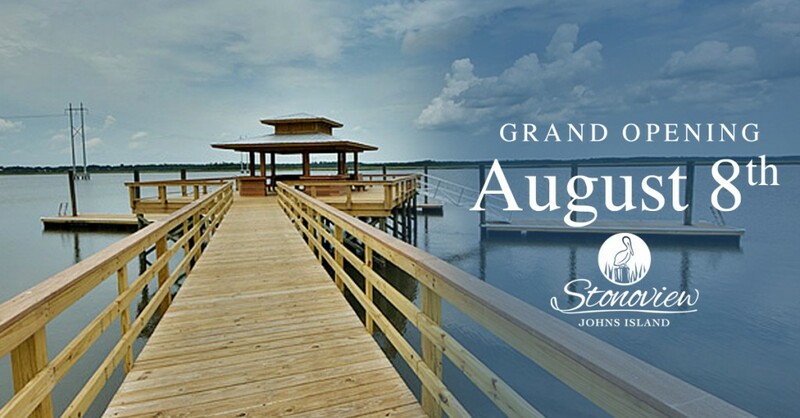 This Saturday, August 8th from 11am – 2pm we hope you’ve made plans to join us for the Stonoview Grand Opening on Johns Island. Brock Built Charleston invites everyone in the Charleston area and beyond to come out and see all the work we’ve been putting into this jewel of a new home community located right on the Stono River, in the Charleston area. This family-friendly event is open to the public and will have plenty of things to see, do, and experience when you get here, with lots of free prize giveaways including a Yeti cooler. 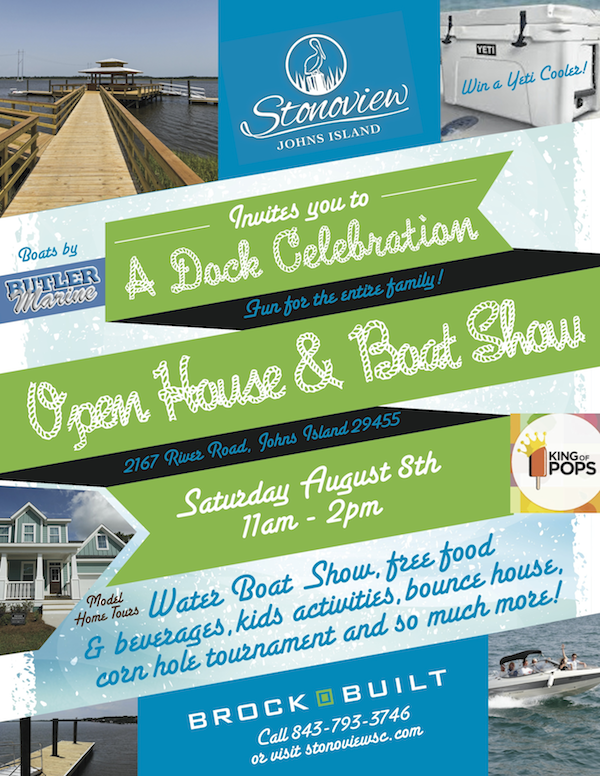 Attendees will get to browse new boats from Butler Marine, enjoy free food and beverages, listen to great music, enjoy family-friendly games and kids activities; plus everyone will be able to tour our newly completed model homes. In addition to this, we are also going to be debuting our new drive under home designs that can be built down closer to the water. Prices for these homes will start in the high $400’s. Located Just 7 miles from downtown Charleston, the Stonoview community grand opening event will be located at 2167 River Road, Johns Island SC 29455. Stonoview, Brock Built’s new community of coastal homes on Johns Island in the Charleston, S.C. area. Situated alongthe Stono River, this Brock Built Charleston community provides the best of the both the Lowcountry lifestyle and coastal living. Along with all the water and boating activities available to residents there are also plenty of walking/ biking trail throughout the community. We plan to have a total of 371 premier home sites in this master planned community. Stonoview offers residents a natural setting with moss-draped oak trees, community dock with sundeck, floating boat slips, on-site boat storage, crabbing, kayak storage, waterfront park & pavilion, community pool, tennis courts, walking/biking trails, golf cart friendly, pocket parks, and several picnic areas. So come on out this weekend and spend some time on Johns Island with Brock Built Charleston at Stonoview – Take a new model home tour, learn more about our latest home plans, experience our new community dock, view some great new boats, possibly win a free prize, take part in family-friendly fun & games, while listening to great music, and enjoying free food and beverages. Invite your family and friends to join us. We hope to see you there. Contact us directly for any questions you may have about Stonoview and this Grand Opening event or any of our other outstanding Charleston area communities.